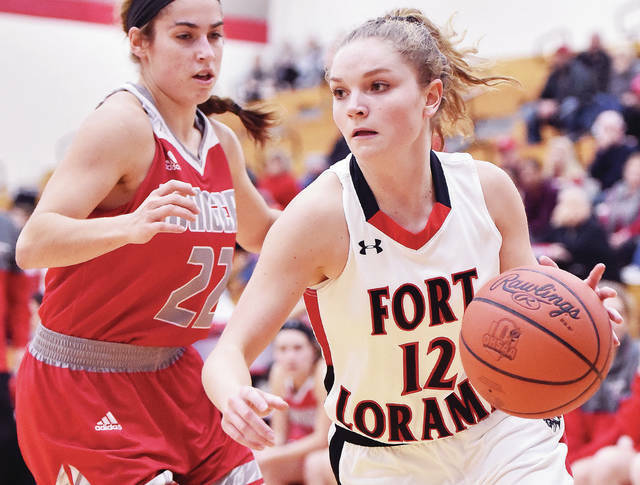 Fort Loramie’s Kennedi Gephart dribbles past New Knoxville’s Erin Scott during a nonconference game in Fort Loramie on Dec. 27. Fort Loramie and Minster are ranked No. 1 and 2 in Division IV in the final Associated Press state girls basketball poll of the season. The Redskins, which are the No. 1 seed in the Sidney D-IV sectional, finish regular play on Tuesday at Marion Local. The Wildcats (20-1) will wrap up regular-season play on Thursday in St. Henry. Versailles and Anna received votes in Div. III. Complete polls are below.